Because 2015 doesn’t have a men’s World Cup or European Championship, the UEFA Champions League final was likely the most important event of the year for global soccer fans (ok, maybe it’s a tie with the Copa América and Women’s World Cup). The season’s final last Saturday pitted FC Barcelona against Juventus FC at the Olympiastadion Berlin, ending in a 3-1 victory for the Spanish side. This title earned FC Barcelona over 250,000 new Facebook fans and 325,000 new Instagram followers over the weekend alone. Interestingly, Juventus FC experienced a even bigger boost! Despite losing the final, they gained 564,000 Facebook fans over the weekend. As for the players, the effects of the big game materialized the day after the final whistle was blown. Leo Messi‘s Facebook page, for instance, saw almost 355,000 new fans on Sunday, many more than the blaugrana scorers of the match: Ivan Rakitic (+19,913), Luis Suárez (+122,406), and Neymar (+115,490). Messi and Neymar also felt their Instagram following shoot up, increasing by 337,000 and 261,000, respectively. 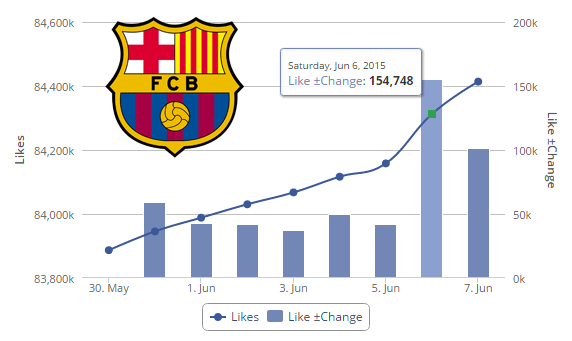 Andrés Iniesta, MVP of the final, gained 65,000 new fans on Facebook and over 92,000 on Instagram Sunday alone. 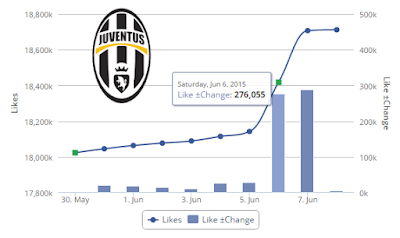 Though the runners up, Juventus players also had boosts in their social followings. Álvaro Morata, Juventus’ lone goal scorer, gained over 48,000 followers on Facebook, 31,400 on Instagram and nearly 7,000 on Twitter. Andrea Pirlo (over 100,000 new Facebook fans this weekend) and Gianluigi Buffon (over 41,000 in the same period) also had material increases. The teams and players weren’t the only ones to benefit by being in the finals — the teams’ sponsors were seen in hundreds of images by many millions of people on social platforms this weekend, driving massive exposure for these brands. As they say, a picture is worth a thousand words. 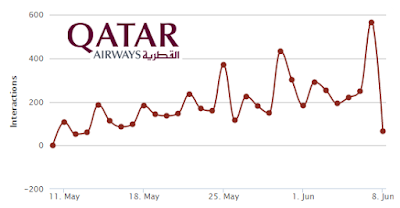 Have a look at the graphs below and you will see the number of times our BrandSpotter™ identified logos of Jeep and Qatar Airways in the last month. Notice the striking spike the weekend of the match. In the thousands of images we identified, those containing Qatar Airways were engaged with over 11.5 million times and Jeep nearly 4 million. Not surprisingly, our Brand Leaderboard showed Qatar Airways, Jeep, and Nike (apparel provider for both Barcelona and Juventus) as three of the top four sponsors with the most social engagement for brands in soccer last week. Until now, brands haven’t had an automated way to analyze the exposure of their offline sponsorships across all social media platforms at scale. Thanks to Blinkfire Analytics’ technology, one can identify actual exposures, measure social engagements and quantify the value of earned media of these sponsorship investments. 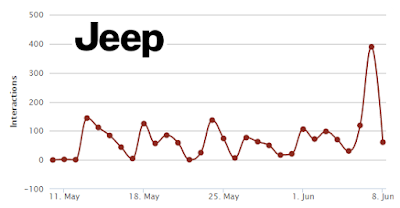 Do you want to better quantify your social inventory for your league or team? Is your brand sponsoring a professional sports team jersey, scoreboard, or signage? Claim your Blinkfire profile now!